Mark your calendar Sunday for Altadena’s ultimate garden party — this year on the wild edge of Millard Canyon, at the home of Tim Cantwell and Stephani Hardy, 832 Millard Canyon Road, Altadena, CA. This home is in LaVina at the top of Lincoln Avenue. 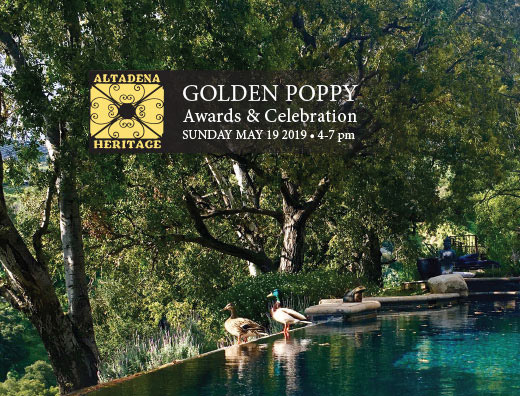 Honor this year’s Golden Poppy winners and enjoy music and food with a view to the Owen Brown gravesite, now being protected from development. Admission: $10 for members. You may join or renew at the door, or online at altadenaheritage.org. Already a member? Please consider upgrading to Patron, which allows you to purchase up to six tickets at the special member price — a great chance to introduce friends to Altadena Heritage and the important work we do. Non-members $25.